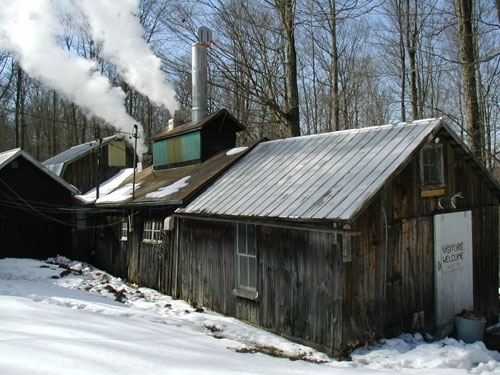 Our family farm has produced pure maple syrup since 1918 by simply boiling the sap from our maple trees leaving only the flavor, sweetness and nutrients that nature has provided. This finest quality pure maple Syrup is delicious over your pancakes, waffles and French toast, in your cereal, yogurt, coffee and tea, and on ice cream...the rich flavor of maple enhances food and is the gourmet's delight. Gallon $42.00 ship wt. 13 lbs. 1/2 Gallon $24.00 ship wt. 7 lbs. Quart $14.00 ship wt. 4 lbs. Pint $8.00 ship wt. 2 lbs. 1/2 Pint $5.50 ship wt. 2 lbs. 3.4 oz. $3.00 ship wt. 1 lb. A sweet, maple spread that is similar in consistency to butter or peanut butter. Made here at the farm from our Pure Grade A Golden Color, Delicate Taste Maple Syrup. 1 lb. $10.00 ship wt. 2 lbs. 8 oz. $6.00 ship wt. 1 lb. 5.5 oz. $5.50 ship wt. 1 lb. 10 oz. $9.50 ship wt. 1 lb. We start with premium pecan halves. Then we boil our own Grade A Dark Color, Robust Taste Maple Syrup to just the right consistency. When the hot maple syrup has cooled sufficiently, a generous amount is pored over the pecans and stirred. This creates a delicious maple sugar coating. A positively irresistible treat! 4 oz. bag $4.75 ---- ship wt. 1/2 lb. 8 oz. bag $8.30 ---- ship wt. 1 lb. 1.7 fl. oz. (50 ml) $3.00 ---- ship wt. 1lb. 3.4 fl. oz. (100 ml) $5.00 ---- ship wt. 2 lbs. 8.45 fl. oz. (250 ml) $8.50 ---- ship wt. 2 lbs. 16.9 fl. oz. (500 ml) $12.00 ---- ship wt. 4 lbs. Assorted painted scene prints; call us and ask for current stock. Made from our Pure Grade A Golden Color, Delicate Taste Maple Syrup and coated with more of the same so the outside is crispy and the inside melts in your mouth. 7 oz. $7.75 ship wt. 1 lb. 3 oz. $4.00 ship wt. 1 lb. Pure maple syrup that is darker in color than our "pancake grade". The robust maple flavor of this syrup makes it an excellent choice to flavor your favorite recipes. Labeled Grade A Dark Color, Robust Taste. Many consumers remember this as "Grade B" cooking syrup. To use pure maple syrup in cooking, substitute 3/4 cup of syrup for each cup of sugar and reduce the liquid in the recipe by 3 Tbsp.